Do you know how to read a nutrition label? I know it is tricky because I spend way too much time staring at them in the grocery store. I decided to write this after I saw a big publication discuss this subject and I thought their answer was VERY confusing. The problem is that we don't have all day to assess food as we put it in our cart. Obviously, the first way to avoid this food label problem is to buy food without the label such as fruits and vegetables. You know they are healthy so pack your cart with them. But, most of us don't buy grain, grind it, and make bread or put yogurt cultures in our slow cooker to make our own yogurt. Kudos to all the bread and yogurt makers out there! The rest of us are stuck buying these products and wondering about their relative nutrition to the vast number of stuff on the shelves. I spend a lot of words on this site trying to help readers compare foods to teach about how important it is to pay attention to the label. I was recently caught off guard in the cereal section of the grocery store when picking out granola with my husband. We were traveling and wanted something we could toss into plain yogurt cups to eat in our hotel (cheap, easy, and nutritious!). I picked one out with what I thought was a reasonable amount of sugar and then he pointed out the serving size. My choice had twice as much sugar as the one he had chosen and I call myself Snack Girl. This label makes it easy because serving size is one package but so many things are not like this. Bread can be one or two slices in a serving!! The new FDA labels are supposed to make serving size about the actual serving that one would eat - but they aren't here yet and the timing of the new labels has been pushed back. In my granola example, my choice was 1/4 cup as a serving size and my husband's package was 1/2 cup. ARGHH!!!! In my scintillating articles What are added sugars? and The smoking gun is sugar, I have outlined why and what sugars are to be avoided. 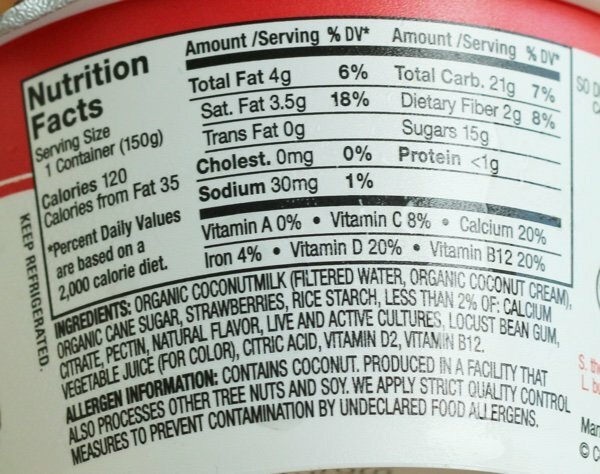 In the above example, the yogurt has 15 grams of sugar or 3 teaspoons. You don't need that much sugar in your yogurt. So many foods have added sugar that we have a nation of people that are pre-diabetic. You gotta cut the sugar for your health. I know it isn't easy but more and more products have less sugar added and they are still good! The new label with have "ADDED SUGARS" broken out so it will make it easier to compare products. This label is PERFECT because you can see both serving size and added sugars very easily. I believe this is the new format and it is going to make my life much easier because my eyesight is going. I love how it is broken down into one serving and the entire container. So helpful!! The added sugar break-out is so important. For example, one granola might have raisins added - which is a natural form of sugar - and seem like the sugar packed option BUT there is no added sugar (impossible to figure out right now). If you don't know how much sugar is added it is impossible to compare products with dried fruit to ones without. This kinda thing drives me nuts. Sugar is added to bread, frozen meals, yogurt, cereal, condiments, tomato sauce, crackers, juices, canned fruit.....a bunch of food that you don't even think need sugar!! Try to pick the products that are lowest in added sugar whenever you can. Your doctor will thank me (he/she can send me a check). 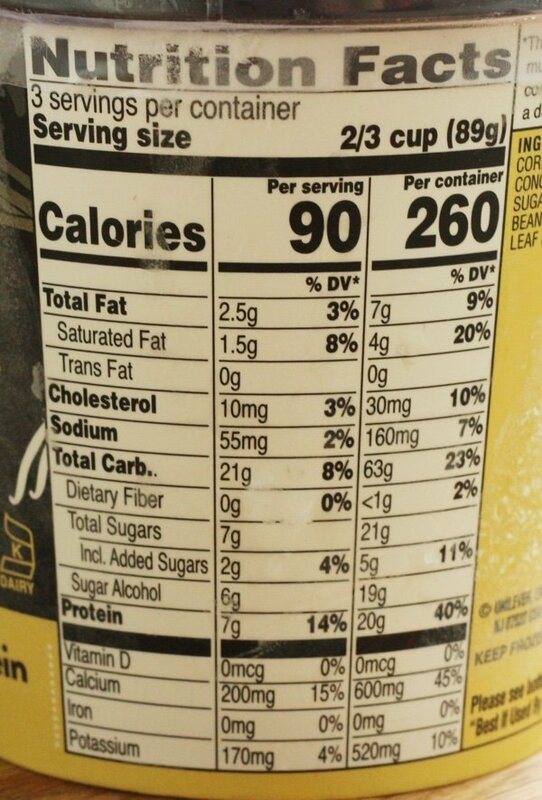 I really think that serving size and grams of sugar are the main points to check on the label. These next tips are for people with a bit more time or are concerned about sodium because of a chance of heart disease. Grams of fiber - When I am looking for a bread or cereal, I will check that there is more than 4 grams of fiber per serving. This usually indicates that the product is whole grain or close to whole grain. The first ingredient - I cannot tell you how many times I find out that the photo on the front is not indicative of the make up of the food. Something with blueberries on the package will have "essence of blueberries" as the seventh ingredient. The first ingredient tells you what you are buying as it is the main ingredient by weight. Milligrams of Sodium - If you are watching your sodium - check it out. I try to aim for less than 500 mg of sodium per serving on any item because I find foods with more to be too salty. You are supposed to have 2000 mg per day but many of us are way past that. 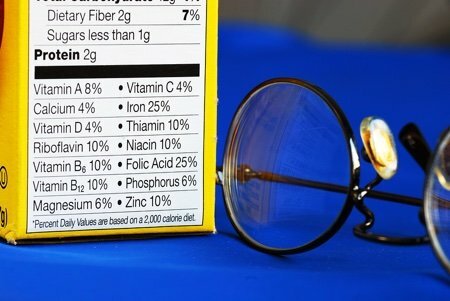 How do you evaluate a food label? What is the most helpful information for you? What is sugar alcohol & should I be concerned about that too? That’s for explaining the new labels. I never have understood what sugar alcohols are. It would be better if the amount of sugar was listed in teaspoons. How do we start advocating for that change? Check out the app: Sugar Rush that scans the food bar code and returns the number of teaspoons of natural and added sugar in an image of teaspoons. It's a great way to learn about how much sugar is in our foods! Hi Janice, 1 gram = 1/4 teaspoon. Personally, I like how grams are used, because it’s an exact measurement (weight), where teaspoon is more of a volume measurement. But I understand where you’re coming from, too... it’s hard for people to visualize how much sugar a gram is. A large paper clip weighs about a gram. Sometimes that helps me visualize the amount. Thank you. I try to read the labels before buying. The sugar has had me stumped before. This helps. Is the encl. sugars of 2g mean it is included in the 7g? Also, is it best for a diabetic to count total carbs, less fiber or sugar. Total carbs, includes the sugars, right? Thank you for breaking this down for us. I was just discussing this with my friend Patti she Is an avid lable reader I will forward this to her. Again thank you. I wish you would have mentioned that it is important to look at how much saturated fat is in your food, too. This article from Nutrition Action Newsletter explains why eating it is still bad for your heart. With many companies changing to palm oil from transfats, the amount of saturated fats is increasing in foods. As a diabetic, I look for sugar and carb amounts first on all labels. We can have sugar alcohols because they don't metabolize the same way as sugar and don't affect our blood sugar readings and have no calories. However, there are some sugar alcohols that will give you gastric upset that can be harsh if you over do it. There are sugar alcohols that just require moderation. I use sucralose (Splenda) mostly in my coffee and baking and it has no side effects that I have noticed and I have been using it for years. It is *not* a sugar alcohol but it is in a lot of foods. Check out the sugar alcohols online to see which ones are best. I found this helpful and I need to follow salt also. Biggest problem is not making listing potassium and phosphorus a requirement. There are thousands of renal patients that depend on that information. Some put it on others don't. I agree with IFortuna. I am also a Diabetic and need to watch the carbs and sugars. You take the the fiber count from the carb count to get the total you are eating. Sugar alcohol is when you eat things that are sugar free. I also use Splenda when I buy sugar free items. Most sugar free chocolate I can't eat. I like 90% dark chocolate. The first foods we get have sugar. @Robin - Sugar alcohols, which are a form of carbohydrate that are not very well digested, are a common cause of upset stomach, particularly when consumed in high amounts. The names of some of the most common sugar alcohols that you’ll probably recognize from packages are xylitol, mannitol, sorbitol, maltitol, and erythritol. Great question! @Janice - the 2 grams is included in the 7 grams - so there are 5 natural sugar grams and 2 added sugar grams. Also - great question! @Vivian - I didn't include saturated fat because most of my readers are looking at low calorie foods and trying to determine which is best. Usually, the ones that are high in saturated fat aren't even being considered by this crowd - but your point is important. Thank you for sharing. I agree with Robin, however there are some out there is ok to eat. However please check with your doctor before eating sugar free. A friend of mine can't have any sugar substitutes because of her medical condition.